Performance Reviews that Work- Performance Through People! Measuring Performance seems to be such an issue with many people I thought I would add some ideas that might help support my previous blog The Seven Virtues of Performance Reviews http://bit.ly/d2UFWB. Traditionally and even today I note too narrow a focus on how Performance Measurement and Reviews are handled in organizations. Learning Point #1 In order to achieve effective communications, team building, results that work, motivation and engagement we need to have effective performance measures in place. Learning Point # 2 Performance reviews and measures must be part of a strategic leadership and management system AND not simply be focused on maximizing future profits. Learning Point #3 We need to move away from the traditional approach of it all being down to financial results and outcomes, that’s too narrow! Learning Point #5 The information used needs to be relevant and contribute to good decision-making. Too much focus has concentrated on what has already happened and looks backwards rather than forwards! Learning point #6 Reviewing performance is about meeting the needs of the future! Learning point #7 Performance reviews are about “building” not “destroying” the people in your organization. Leaning point #8 Performance reviews are not an extension of your accounting system; they are part of your business culture. Learning Point #9 Crucially performance reviews were viewed as influencing behavior- failure to perform was seen as punishment thus stifling innovation and creativity. Learning Point #10 Performance Reviews, are there to develop not to punish your employees! 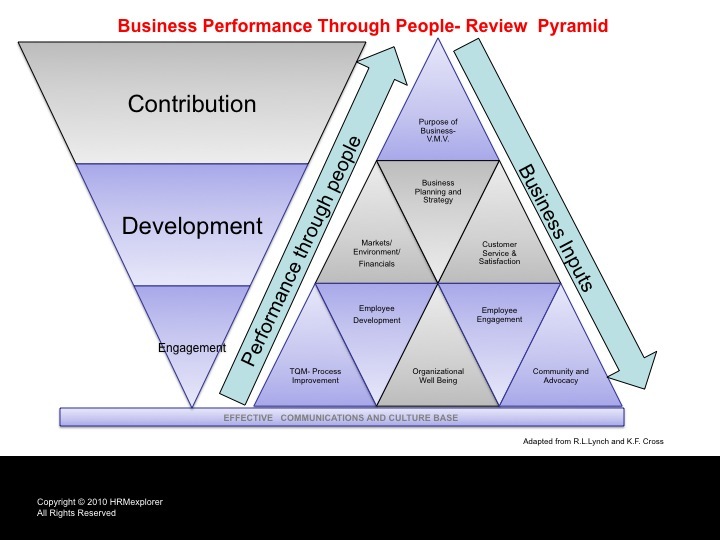 A great way to look at the basis of the new approach is the Business Performance Through People – Review Pyramid – see picture on this blog!